Spray 4- to 5-quart slow cooker with cooking spray. In cooker, place garlic and oil. Sprinkle chicken with salt and pepper; place in cooker over garlic. Place mushrooms over chicken; pour wine over all. Remove chicken from cooker; place on plate and cover to keep warm. In small bowl, mix water and cornstarch until smooth; stir into liquid in cooker. Increase heat setting to High; cover and cook about 10 minutes or until sauce is slightly thickened. Return chicken to cooker. To serve, spoon mushroom mixture over chicken breasts; sprinkle with parsley. When making chicken in a slow-cooker, remove poultry skin and excess fat before cooking to reduce fat in the finished dish. Brown poultry in a skillet before slow-cooking to add both color and flavor. Want to take your slow-cooker meal to an outing? Simply wrap the slow-cooker in a towel or newspaper to keep it warm. Attach rubber bands around the handles to secure it for travel. Using a slow-cooker at high altitude can be tricky. At high altitudes, longer cooking times are necessary for most foods, especially meats. To shorten meat cooking time, try the High setting instead of the Low setting. Marsala wine is from the Marsala region near Sicily in Italy, commonly used in cooking. It comes in both sweet and dry variations but we recommend using the sweet version of Marsala as the dry makes this dish too acidic. 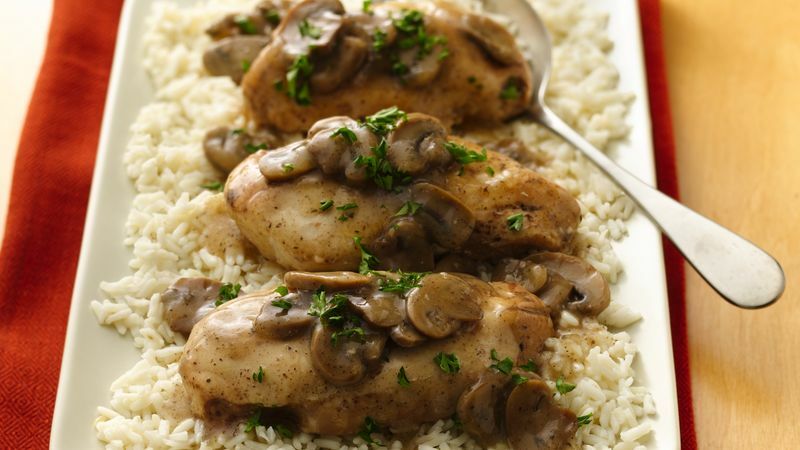 Serve chicken Marsala on a bed of rice, or over hot cooked pasta. Love Marsala mushrooms but don’t love chicken? Or just looking for an incredible creamy slow-cooker side? Try this Creamy Slow-Cooker Marsala Mushroom recipe for that amazing Marsala taste in mushroom form.